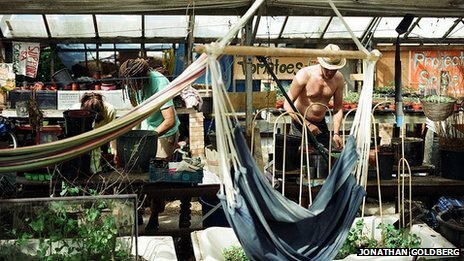 The “Grow Heathrow” community, who have turned an area in Sipson that was once a “derelict mess”, into a thriving market garden, are facing eviction. However, the young people living there are popular with the local community, who want them to stay. When they arrived several years ago, they cleared as much as 30 tonnes of rubbish off the site, renovated greenhouses and now grow organic lettuces, courgettes,squashes etc. The site happens to be where a 3rd runway was to be built – a location in many of their neighbours’ interests to protect. The owner of the land wants his land back, and a hearing at Central London County Court began on Monday but the judge has decided to take more time, so they are not due back in court for several weeks. The court is expected to weigh up the human rights and hard work of those who have moved in against the simple fact the land is not theirs. Court is now over and the most important thing everyone needs to know is that we have not yet been handed a judgement. The judge is going to take some more time to really read into the issues and both parties are expecting to receive a written judgement at some point in the next few weeks. Overall we’re feeling positive that all the arguments have been heard and all we can do now is cross our fingers. We will share the news and probably call a press conference as soon as we find out the result. Keep checking the blog and following us on twitter for updates. Squatters are rarely the most popular residents in a neighbourhood. But on Vineries Close in Sipson, west London, resides a group of squatters many of the local people are keen to see stay. Residents say they like the occupants because they have turned what was once a “derelict mess”, into a thriving market garden. The squatters have renovated greenhouses and grow lettuces, courgettes and squashes that would raise the eyebrow of many an organic greengrocer. They also happen to be on a site that sits directly in the path of where Heathrow Airport’s third runway was to be built – a location in many of their neighbours’ interests to protect. 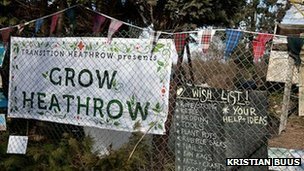 But the squatters – who call themselves Grow Heathrow – face possible eviction as the owner of the land wants to remove them from the site. A hearing at Central London County Court begins on Monday. It is expected to weigh up the human rights and hard work of those who have moved in against the simple fact the land is not theirs. Grow Heathrow claims the land had “previously been problematic for the local community and was often a site of anti-social behaviour before it was virtually abandoned”. 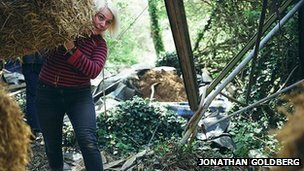 It says it cleared “30 tonnes of rubbish” when squatters moved onto the land. “There were needles, there was broken glass, there were scrapped cars, and we found a whole tank of diesel,” said Olive Morris from Grow Heathrow. But even if the land has been tidied up, is this not a bit like getting into someone else’s house, redecorating it, and then saying because you have done that you are entitled to it? “We were asked by the community residents to come here and to make it something they could be proud of,” responded Ms Morris. Grow Heathrow also claims to share practical skills such as permaculture design, bicycle maintenance and wood and metal work with the community. But Mr Malik’s solicitor responded: “Whilst no doubt Grow Heathrow have put in a lot of work in clearing up and improving the site, at the end of the day this gives them no legal right to continue trespassing on the land. The squatters said “during months of attempted negotiations” they have tried to purchase the land as part of a community land trust. To remain on the land, the squatters have a tough battle on their hands, but if they win the case could set a precedent for land use elsewhere. A previous court case for possession of the land at Uxbridge County Court in November 2011 was adjourned because the judge accepted some of the defendants’ arguments which were based upon Article 8 of the European Convention on Human Rights – the right to respect for private and family life – meaning a higher authority was needed to rule on the case. The coalition government has ruled out building a third runway at Heathrow. An aviation consultation will publish its findings this summer. The hearing over Vineries Close is expected to last for two days. Transition Heathrow. We’re not going anywhere ! Posted: Monday, June 18th, 2012. Filed in News about Airports, Publicity & Politics, Recent News.